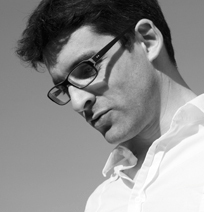 A French composer born January 2, 1977 in Machecoul. Jean-Pascal Chaigne studied at the Conservatory and the University of Tours, then at the Sevran Conservatory with Allain Gaussin. He completed his training at the Paris Conservatory in the composition classes of Emmanuel Nunes and Stefano Gervasoni. Chaigne has written for solo instrument (De miroir, d’absence for viola da gamba, 2016), for chamber ensembles (Entaille for string quartet, 2015), for chorus (L’élaboration du silence for female chorus, 2012) and orchestra (Der Bau, monodrama for reciter, vocal sextet and chamber orchestra, 2015). He is particularly interested in poetry: his scores are nearly always inspired by the work of poets such as Anne-Marie Albiach, Claude Royet-Journoud, Roger Giroux and Danielle Collobert. In reference to Mallarmé’s Livre, he groups his works in cycles as coherent and constructed ensembles: ‘Le travail du silence’, ‘Mezza Voce’, ‘Objets’, ‘Hymnes à la nuit’, ‘Les chiffres du corps’ and his ‘Triptyque’ from Kafka (2015-2016). With a doctorate in musicology, the author of several articles, Jean-Pascal Chaigne is also active as a researcher. Having taught harmony and counterpoint, composition and analysis in the universities of Nice and Saint-Étienne, then composition, orchestration, harmony and counterpoint at the Regional Annecy Conservatory, he is now teacher and researcher at the Haute École de Musique in Geneva. Les partitions de Jean-Pascal Chaigne sont inédites. CHAIGNE Jean-Pascal. Les quatuors à cordes de Nicolas Bacri : illustration d’un parcours esthétique par le biais de l’étude approfondie du Quatrième quatuor opus 42. Mémoire de Maîtrise de Musique. [Tours] : [Université de Tours], 2000, 93 p.